Delaware Highlands Assisted Living – Welcome to Wyandotte Daily! Residents of Delaware Highlands Assisted Living celebrated Mardi Gras Tuesday, March 4, with music and dancing of the Women of the Drum. 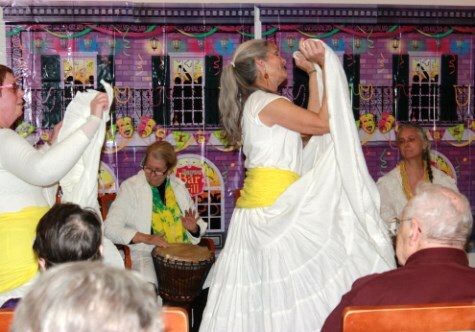 The performance included rhythmic chanting, dancing and drumming with music derived from Brazil and Haiti. “Top our party, New Orleans, if you can,” said one resident of the center. The Mardi Gras party included beads, masks and king cakes, along with music and dancing.